A portrait once believed to be George Washington's enslaved cook, Hercules, was submitted to the scrutiny of a dozen art experts under the UV light, right. MOUNT VERNON, Va. — The room lights went out, a black light flicked on, and the face of Hercules disappeared. Perhaps forever. Only the details of the clothing on the Colonial-era portrait were visible. A white tall hat, an embroidered silk coat, and a ruffled cravat glowed eerily in the ultraviolet light as a dozen art experts from around the world gathered at Mount Vernon to solve an art mystery that has lingered in the public’s imagination for half a century. The 18th-century painting of a regal black man has for decades been presented as an image of Hercules, George Washington’s celebrated but enslaved chef, who toiled at the President’s House in Philadelphia and at Mount Vernon and then made a successful escape. Titled Presumed Portrait of George Washington’s Cook, it has been attributed to American master Gilbert Stuart everywhere it has been presented, from its home at a Spanish museum to reproductions at the Smithsonian Museum of African American History, Mount Vernon, and on the covers of several current books. A reproduction also hangs in the Liberty Bell Pavilion at Independence National Historical Park, where I first saw it a decade ago and was inspired to write a two-part series about the chef for the Inquirer. Dorinda Evans (left) and Ellen Miles inspect the painting once believed to be Gilbert Stuart's portrait of chef Hercules at Mount Vernon in 2017. Because of that work, I was invited to participate in the study at Mount Vernon. And that day, a part of American history was about to be rewritten. Another art mystery would be launched. Some of the most basic assumptions about what people see and accept when they view an image were challenged. And as a result, a promising new light would be shed on the chef’s mysterious fate. “This is very different from how Stuart would have done it,” said Dorinda Evans, a Gilbert Stuart scholar and professor emerita at Emory University, who was certain that both the painter and subject had been misidentified. The other scholars, curators, and conservators appeared unanimous. But there was one more blockbuster twist. The hat, perceived to be a chef’s toque for as long as the painting has been known to modern viewers, was in fact not a cook’s hat at all, Evans said, but a Caribbean headdress similar to one worn by free Dominicans in the West Indies depicted in paintings by the Italian artist Agostino Brunias. "Free West Indian Dominicans," ca. 1770, by Agostino Brunias, depicts a headdress similar to the one in the painting once believed to be the chef Hercules. The experts’ verdict: The painting is genuine to the late 1700s, and the unknown subject was a person of noble importance. But it wasn’t painted by Stuart. (Nor was it painted by Brunias.) And the subject wasn’t even a chef — definitively ruling out Hercules and setting in motion a cascade of implications for historians at a moment when interest in him and others enslaved by the Washingtons remains high. In fact, the conclusions of this meeting of experts, conducted in private two years ago but made public only now, helped spur a researcher last month to discover what might in fact be a record of the elusive chef’s burial place. That chef just wasn’t the man in this painting. The painting, long held as a potential key to the chef’s story, turned out to be a false clue, another myth in a Washington universe full of them, “like the cherry tree and the wooden teeth,” said Mount Vernon senior curator Susan P. Schoelwer, who coordinated the study day along with associate curator Jessie MacLeod. The kitchen at Washington's Mount Vernon estate, where Hercules cooked. Hercules the man was very real. He was sold to George Washington as a teenage “ferryman” in 1767 by a neighbor, John Posey, as payment for a debt. And his labors for the Washingtons were well-documented at Mount Vernon and in Philadelphia, where he was renowned for the feasts he cooked at the President’s House between 1790 and 1796. He escaped from Mount Vernon in 1797 — on George Washington’s birthday — and was never captured. These facts, drawn from house accounts, farm logs, letters, and reminiscences, have fashioned the chef as a hero whose culinary talents earned him special privileges from the Washingtons and an income from selling kitchen scraps that afforded him a notable sartorial style. He was recalled by Washington’s stepgrandson, George Washington Parke Custis, as a “great master-spirit” in the kitchen who, after the meal, would don fine black silks and a gold-headed cane for evening promenades down High Street. Though he was dressed stylishly, walking the streets of an abolitionist-minded city known as a haven for free blacks, Hercules was still an enslaved man — and he was eventually left in Virginia and set to hard plantation labor. What became of Hercules after his dash for freedom has long remained a mystery. This painting, now owned by the Museo Nacional Thyssen-Bornemisza in Madrid, was long thought to be a clue. But fundamental questions about the painting’s relationship to Hercules persisted. They were definitively dispelled in the ultraviolet light of the private study day two years ago when the painting was removed from the walls of Mount Vernon after an exhibition in preparation to be returned to Spain. Paloma Alarcó, the Thyssen-Bornemisza curator who attended, agreed to the examination (and my attendance) under the condition its results not be made public until the museum could conduct its own follow-up studies. This is hardly the first old painting to be misidentified in the often shadowy world of art collecting. Its identification as Washington’s cook was likely added in the mid-20th century to increase the value on a work already misidentified earlier in the century as by Stuart, who famously painted the president in 1796. It remained in private hands and largely unstudied by scholars until it was sold in 1983 to Baron Thyssen-Bornemisza, whose massive collection became the museum, which simply cataloged its previously ascribed provenance as the painting arrived. But Hercules, as one of the most visible individuals enslaved during that era, in part due to this image, carries extra cultural significance because of the growing dialogue about the founding fathers and their troubling involvement with slavery. And as I shared news of the painting’s removal from the record, it brought a mix of disappointment and resignation. The books "The President's Kitchen Cabinet," "Lives Bound Together: Slavery at George Washington's Mount Vernon," and "The General's Cook." 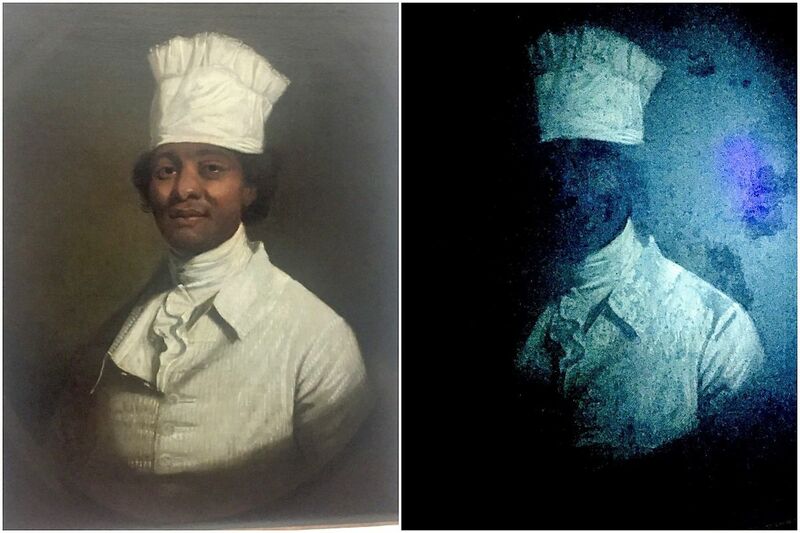 The painting used on these covers was long believed to be a portrait of chef Hercules, the enslaved man who cooked for George Washington, supposedly painted by Gilbert Stuart. Those attributions have recently been dismissed by experts, and the both subject and painter are now unknown. Ramin Ganeshram’s new novel, The General’s Cook (Arcade, 2018), not only used the image on its cover but wove a relationship between Stuart and Hercules into a plot of her fictionalized account of the chef’s life. “I’m shocked, but I’m not shocked, because the hat always nagged at me,” she said. The image has also been seen by millions of visitors each year at Independence National Historical Park, where it anchors an information panel that addresses the irony of slavery at the President’s House just steps from a universal symbol of freedom. What Martha Washington did not mention was that she had already freed her husband’s slaves in January of that year, acting early upon a wish from George’s will with an emancipation that also applied to Hercules. That New York correspondence has long been the last known clue to Hercules’ fate. And it’s a thread that Ganeshram and Sara Krasne, a colleague at the Westport Historical Society where the novelist is executive director, began to pursue in February with a startling new discovery — a New York City death notice that just might be him. News of the painting’s changed status, with its ramifications for the cover and plot of The General’s Cook, jolted Ganeshram and her colleague to a fresh burst of archival research. “What if Hercules was hiding in plain sight?” suggested Krasne, the historical society’s archives manager. A death record for Hercules Posey, who died on May 15, 1812, in New York City. They looked back to John Posey, Hercules’ previous owner, for more clues. They found one. Krasne uncovered the burial record for Hercules Posey, a Virginia native born in 1748 who was listed in the 1812 city directory as a laborer who lived at 33 Orange St. and who died of consumption on May 15, 1812. He was buried at the Second African Burying Ground in Lower Manhattan — a grave that Ganeshram believes is still under the Christie Street sidewalk on the Lower East Side. A pair of historians agreed. And so, 222 years after Hercules’ daring escape, the great chef may have been found.